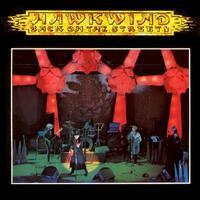 This is a new release of an older single from Hawkwind. It’s a classy issue pressed on white vinyl. This is great for those who never got the original single, but I’d also recommend it for collectors wanting both. I’ve reviewed the original one before, and for the sake of consistency, the following is taken from that review. Since I reviewed the Side A track when it appeared on the Epoch Eclipse box set, that track review is included here for consistency. Let’s just say that I’m glad I have this record and I’d buy it again given the chance. This is simply a straightforward Hawkwind rocker. This builds out gradually and has a lot of the trademark Hawkwind tribal type chanting.